Full Tilt have now increased the cap of the number of cash tables you can play to 16. I played 14 two nights ago, and 16 for much of last night/this morning. I had no problem handling 16 although it makes it more difficult to go for a piss and get back before timing out. I'm still waiting on getting my 3rd 30" Dell monitor connected so for now I have been playing with a slight overlap with the extra 4 tables. 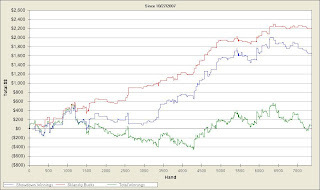 The 1st graph shows that I "won" over $2.2k Sklansky Bucks. 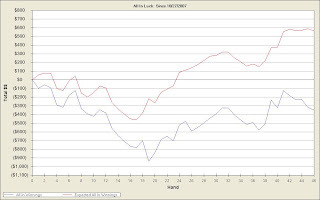 * The "All In Luck" graph shows that I was due an extra $900 worth of equity from all-ins! Sklansky bucks/dollars are theoretical money won or lost based on the Fundamental Theorem of Poker. The FTOP is discussed in The Theory of Poker. Basically, if you lose a hand but your opponent made mistakes, such as drawing to a flush without proper pot odds, you may lose the pot but you have earned Sklansky bucks by causing your opponent to make a mistake. On the flip side. If you are drawing without odds but you get luck and draw out on your opponent, you win the pot, but you lose Sklansky bucks. I like the idea of Sklansky bucks. How did you go about calculating them? RWS: PokerEV performs the calculation for you. where do u get all the graphs from? The graphs are from a free program called PokerEV - it's very good and can run many more filters on your game than Pokertracker alone. Mike, a word of warning; you cannot look at the difference between the sklansky bucks 'red' line and the profit 'green' line and conclude that you are due $dollars. That graph doesn't work like that - it can give you broad indications but the program author makes it clear you can't use that graph to determine your luck. This is why there is the all in luck graph tab which is an exact science. If it says you are $900 down on expectation then you are $900 down on expectation. Only use this graph to determine your 'run' - the other one is to determine broadly how you are playing. For example if you have have slightly negative blue and red lines then you often put your money in with the worst of it. If you are a fish you will then find your green line deeply negative. If you are a legend then you have a very positive green line because you have perfected the lag style. Your other graph suggests you have the TAG/sTAG style down to a 'T' with all lines tracking roughly the same and in the positive. Another thing to be aware of is the way the luck graph is calculated. Lets say you get into a rasing war with AA preflop as an 80% favourite. You started with $1000 and villain covered. The final all in you make is for $100. Your expectation for the pot is $1600 being 80% of $2000. However, PokerEV only looks at the final all in bets thus it will examine the outcome of the $200 ($100x2) bet of which your equity is $160. how are you still having overlap when you have 2 30" monitors? Seems like you could just resize. A 3rd 30" seems like overkill, but just my opinion. I have been 16 tabling on a 24 and 20 inch monitor. My 20 is a little duller in brightness so I play 12 on the 24 and 4 on the 20. Obviously I could shrink the tables and play with no overlap, but I prefer to use large, clear tables. Cheers for the explanation Kenny. Um, the green line being way below the other two says nothing about your luck. Sklansky bucks can obviously only be calculated when the hand goes to showdown, since only then are your opponents' cards revealed. The red line and the blue showdown winnings line both therefore only relate to hands that went to showdown. You can compare those two lines to get an indication of how badly you're running. If you had broken even in non-showdown pots, the green line would look roughly the same as the blue line. The fact that it is well below shows that you are folding a ton of hands. Over a short sample this could mean that you were just beaten a lot and had to fold. Over a large sample it means you are probably too right.